IMPORTANT NOTICE: Do these mods and fixes at your own risk! All of the information on this page is copyright to me as I have spent a lot of time working it out, please link to this page rather than copying my info into other websites. Linking to this page to help sell your radio on ebay is fine, and I'm even happy to answer questions for your bidders to help with the sale, but please respect my copyright and do not plagiarize my website. Also known as: expand the channels, more channels, 10 meter conversion, wideband modification. On the non-UK models the display shows "Mhz" instead of ".25" and "AM/FM" instead of "UK/EU". When you do these frequency mods on a UK EM-27 the radio will be on frequency, but will still show ".25" in the display. There is no known easy way to remove the ".25" from the display window (other than to buy a knackered Stabo and change the display panel). 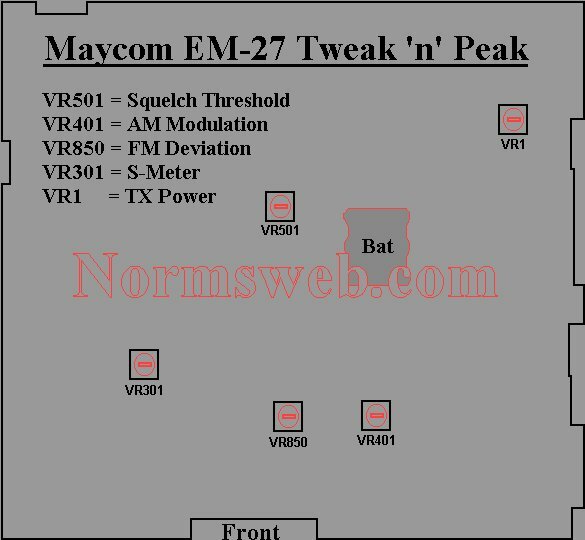 This mod will allow you to mod your Maycom EM-27 to 400 channels mode "secretly". When turned on, it looks and works exactly the same as a non-modified 80ch UK EM-27. However, if M4 is held whilst turning on, the radio will be in 400ch mode (25.165 MHz - 29.655 MHz). 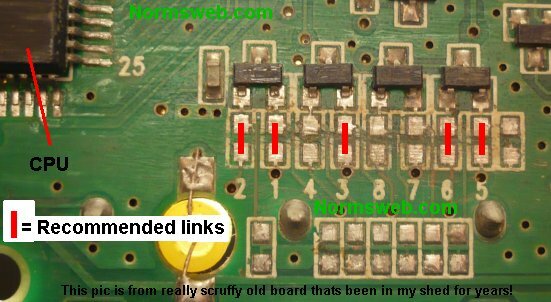 Near the main processor, on the Front Board, you will see 8 solder-links (as pic) labeled 2,1,4,3,8,7,6,5. Link 2,1, & 3 then clear all other links. (except 5 & 6 if you've done those mods). Make sure the back-up battery is installed (if it isn't then the radio may lock up). Momentarily short the battery to reset the CPU. Depending on which country your radio was from originally, there will be tiny SMD capacitors on some of the links. (EG. on link 3 for a UK radio) If the capacitor is on a link which you want to use in the modification you can just leave it there and do not need to solder that link, however if a capacitor is on a link which you do not want to use for modification then it MUST be removed or your mod won't work correctly. When you have done all your solder-links for your modification, the backup battery MUST be shorted momentarily to reset the CPU. With the radio turned off and unplugged from the power supply, use a short wire to link the 2 points shown in the photo for about a second. Your battery may be different to this one, or it may even be a small capacitor. To my knowledge there are at least 4 different types of battery / capacitor used in this radio, but you still need to short these same 2 points whatever battery / capacitor your radio has. This mod will allow you to convert your radio to 200, 400 or 600 channels mode.For 200ch link 8, for 400ch link 7, for 600ch link 7 & 8. Clear all other links (except 5 & 6 if you've done those mods). Make sure the back-up battery is installed (if it isn't then the radio may lock up). Momentarily short the battery to clear the memory. It's not possible to get the radio transmitting from 23.815 Mhz to 30.555 Mhz without major VCO mods. I did this mod several years ago and have only recently re-found the video. What do you do if you have a broken 5 inch TV? You take the remote control circuit out and fit it in a radio! I can't remember the exact model of TV, but the remote control circuit (as it turns out) was on a seperate little board, which made this mod SO MUCH easier... The RC board needed some minor modification to make it work with the EM-27 and I ended up with a board that would ground three different pins when the remote buttons were pressed. In 200, 400 or 600ch mode, Pressing M7 with FUN flashing (blank) puts radio in repeater mode; the screen indicates RPT above the channel number. This allows you to transmit on one frequency and receive on another. To use, select the desired TX frequency, press M7 so RPT is displayed, and then select the desired RX frequency. When you press the mike the radio will jump to the TX freq then return to RX freq when you release the mike. 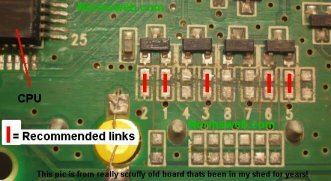 Link option 5 on the above solder-links to enable 5kc shift. To use, hold M1 and press M6. In 200, 400 or 600ch mode the radio will display the change, however, in 80ch mode the display does not change but the frequency does. Also known as: tune up, adjustment, retune. Here is a picture showing the adjustment points within the radio. It is advisable to mark the pots before adjustment, so you can put them back to their original positions if you need to. Another good rule to stick to is: If you are not sure what it does, dont turn it! The chances are that you are looking at a radio that won't do a heck of a lot. The lights behind the display will light, but nothing else happens. Pressing buttons won't do anything, but if you key the mike, you may (or may not) notice the lights get slightly dimmer. 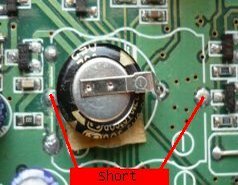 To Fix, you need to locate the surface-mount 5v regulator transistor (IC 300 - KIA78L05) and replace it. Its located roughly in the center of the board near the back, surrounded by small electrolytic capacitors. The legs on the regulator, with the display facing you are from left to right: Out (5v), Ground (0v) & in (12-14v). the forth leg at the top is also Ground (0v). If you are careful, you can replace it with a standard 7805 regulator (on wires, bolted to case) and it works fine. You should also check/replace R310 as required. If when turn on your radio it all lights up fine and appears to work ok, but you get a loud howling or squealing noise coming from the speaker then you should remove or replace the back-up battery (or capacitor). In this radio, when the back-up battery goes bad the radio makes the loud howling noise. Unplugging the microphone disconnects the speaker so the howling will not appear when mic is not plugged in. Update: This solution will usually stop the squealing noise, but I have since found that there may be another bad component in the radio causing the noise, so after you replace the battery the noise *may* come back within a few days/weeks. As soon as I can find out exactly which component it is, I will update this section with a fix. If you are occasionally getting nothing happening when you key the mic, try keying the mic slowly. You will probably find that when you key slowly the radio will transmit every time. This indicates that the mic switch needs cleaning. Open the mic and squirt some switch cleaner or contact cleaner spray into the switch and key it rappidly a few times (do not use WD40!!!). This will fix it 90% of the time. On this radio, Q306, a KRC110S is o/c base to collector. It receives the TX CTRL B+ signal from pin 16 of IC001 and drives Q300, a KTA1505S which switches on the VDD TX B+ supply for the TX electronics. This supply is separate to the multitude of main ones (TX REG B+, MAIN REG B+, VDD B+ etc) and only exists for small part of the circuit so is easy to miss, and when missing everything appears to work except the TX power. To download the schematic, right click on the link below and click on "save target as.."
Its only if you have got an early orange screen Maycom that you really need to panic about replacing the battery. The early radio's had a "barrel shaped" backup battery that was very unreliable and more often than not, leaked, causing untold and usually un-repairable damage to the PCB. Later radio's have a flat "disc type" lithium battery which (so far) seems to be very reliable. This "disc type" lithium battery is, by some, mistaken as a capacitor and does not (usually) need replacing.